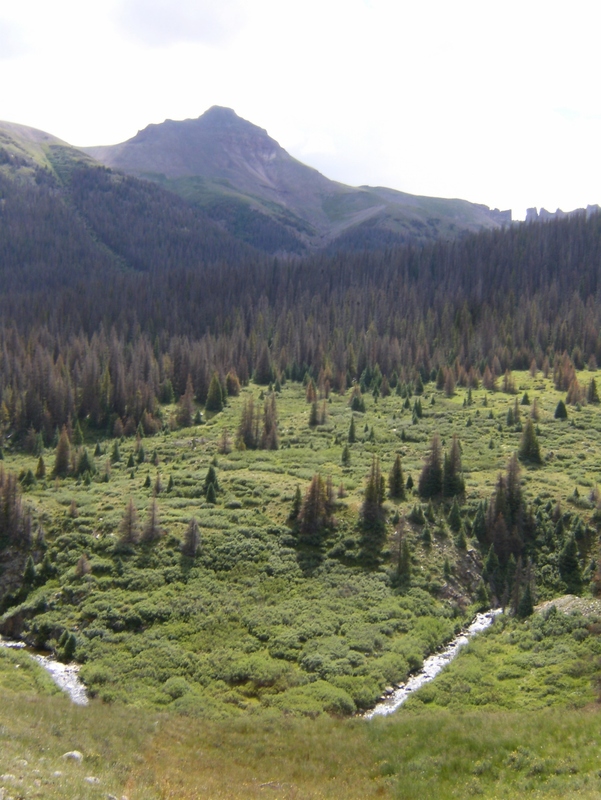 The Weminuche Wilderness covers about 500,000 acres of southwest Colorado’s San Juan Mountains and is the largest in the state. I and 4 other guys (RC, JH, TC, & WN) spent about 6 days exploring much of the Ute Creek watershed from the Rio Grande Reservoir all the way up to the continental divide (elevations of about 9500′ to 12000′). 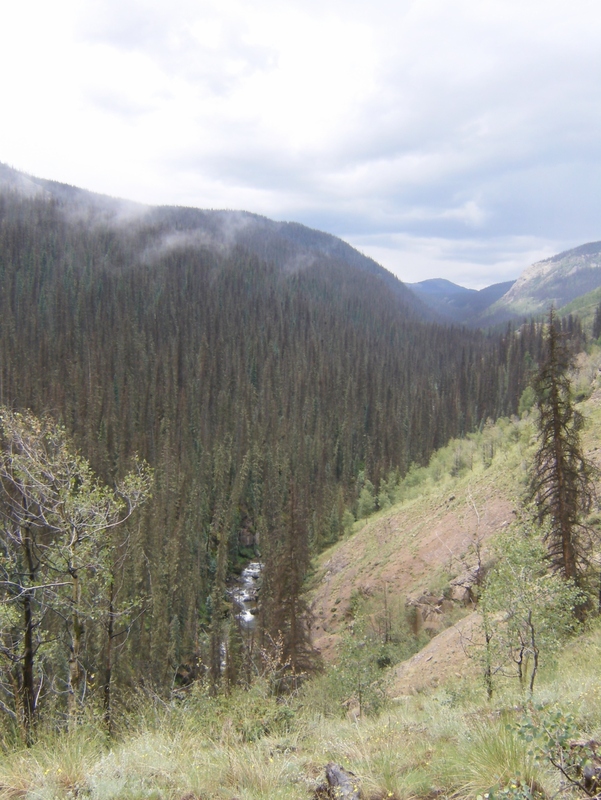 Donna Ikenberry has a great book for this area and the neighboring South San Juan Wilderness. Trails Illustrated map #140 is also very helpful. Day 1 (Sunday July 27th): We started at the Ute Creek trail head a bit north west of the Rio Grande Reservoir. Less than 100 yards from the parking lot we waded across the Rio Grande river. Water levels were low enough for us but can be dangerously high. This far north we didn’t have to worry so much about CBP. The trail immediately heads up a hill through a grassy area towards the woods. With the heat of the day, the altitude, and the backpack weight, it was no more than 5 seconds before I was breathing hard and feeling miserable. A bad omen, I thought, but the trail soon leveled-out and I caught my breath. We crossed the wilderness boundary just before entering the woods. The trail climbed gradually, for the most part, all the way to Black Lake. Early on, there are some ledges with great views of Ute Creek rapids far below. Just beyond those the trail drops a bit and skirts the edge of a large beaver pond/marsh before climbing back into the woods. That’s when the rain started, and it continued at varying intensity for several hours. We initially took refuge in a cluster of spruce trees while we had a snack but realized it could rain far longer than we could wait so we got back on the trail for several soggy hours to our first camp at Black Lake. By then the rain had pretty much stopped and we were able to set up camp, look around a bit, and even start on dinner. Before we finished dinner, though, the rain started again and continued until about 4AM. Day 2: We awoke to a cloudy sky but it soon gave way to scattered sunshine. We continued on the trail, past Black Lake (which really is very dark with tannins), and into the huge meadow along Ute Creek. Here we gave up some of our hard-won elevation to cross several streams (with West Ute Creek demanding a temporary change of footwear). Soon, a couple of the area’s famous features came into view. The Rio Grande Pyramid is a prominent 13821′ peak and The Window is a big notch in the adjacent ridge line (just right of center in the photo). The variety and sheer number of wildflowers was pretty cool – we apparently hit the peak of the bloom. We turned south at the junction of trails #819 & 905 and began climbing toward Ute Lake but stopped to set up camp before climbing beyond the tree line. I was the first to get dinner started. It was rehydrating by the time the others got started but that’s when it began raining and most fled for their tents. TC and I took refuge under a mostly-dry spruce tree while he tried to get his stove lit but everything was too wet by then and he gave up. I was the only one that got a hot dinner that night but I probably got wettest as well. Day 3: Another cloudy start with low clouds obscuring many of the surrounding peaks. We day-hiked up past Ute Lake to the continental divide area. We had some breathtaking views of Ute Lake, many of the Flint Lakes, and surrounding mountains as the fog broke up and the sun came out. As we headed back down to camp it started raining again, but by the time I got my rain coat and pack cover on it stopped. Around 4:30 we could see some pretty dark clouds in the southwest and figured if we wanted a hot meal that night we better get started. Everyone but RC got their dinner going before it started raining. I ate under the same spruce tree as the night before while the others ate in their tents. Fortunately, the rain only lasted about 30 minutes. RC got his hot dinner after all. A couple mule deer came down out of the woods. One stayed close to the tree line but the other seemed very curious and hung-out pretty close to our camp, grazing and keeping an eye on us. It will probably be among the first killed during the next hunting season. We had a few sprinkles that evening but saw our first sunset of the trip, and even saw some stars that night. It started raining hard about 5 minutes before we got back to camp and stopped shortly after – just long enough to get us and our stuff nice and wet again. We ate a leisurely dinner at a normal time under partly cloudy skies. Night time was mostly clear with abundant stars. Day 5: Another clear and chilly morning. We began the long trip home with a hike back through the big meadow to Black Lake. I was able to get one more picture of Rio Grande Pyramid and The Window, this time with better lighting. Rio Grande Pyramid and The Window, from the west side. It started raining hard about 30 minutes before we got to Black Lake and stopped for a few minutes while we set up camp. I think I set a new speed record for erecting my tent. It rained off-and-on for about an hour, then cleared a bit. We hiked around to the south side of the lake where there’s a little hill with a great view of Ute Creek and the meadow. Another mostly-clear night with stars. Day 6 (Friday August 1): The hike out. Technically, we had covered this ground on the way in but this time it was mostly sunny and we didn’t have to keep our head down to keep the rain out so much of it seemed new. Once more across the Rio Grande. Welcome home, amigos! I used-up my camera battery on the way out taking pictures of wildflowers. There were many found only at higher altitudes that are not represented here. It was a great trip, despite the rain and the long drive. Daytime temps were getting into the low 70’s with night time temps around 50 when cloudy/rainy and low 40’s when clear. The wildlife continued to be elusive, other than a few mule deer. There were lots of elk tracks, some very fresh, but no sightings. There were feline tracks in the muddy trail but no sighting. It’s time to start thinking about next year’s trip. This entry was posted in Uncategorized and tagged Colorado, Continental Divide Trail, Hiking, Rocky Mountains. Bookmark the permalink.